After the panel for Thor came to a close, Marvel Studios president Kevin Feige told us that he knows it’s getting late, but there’s a quick surprise he wants the audience to see. The lights dimmed and a video began to play with a voice over by Samuel L. Jackson. Samuel L. Jackson then hit the stage much to the audience’s delight. He approached the podium and said that there’s a group he wants to introduce us to — he began his role call: Clark Gregg as Agent Coulson, Scarlett Johansson as Black Widow, Chris Hemsworth as Thor, Chris Evans as Captain America, and Robert Downey Jr. as Iron Man. With all of them on stage, Robert Downey Jr. took over the podium and introduced the audience to Jeremy Renner as Hawkeye and Mark Ruffalo as the Hulk. He went on to introduce Joss Whedon as the director. The crowd went completely nuts for the cast and director of the Avengers. Downey was barely able to contain himself, giggling and saying that he can’t help himself. He was too excited. Joss Whedon went on to say that he had a dream his whole life, but it wasn’t this good. He told the audience that he’s afraid he’ll blow it and needs our support. 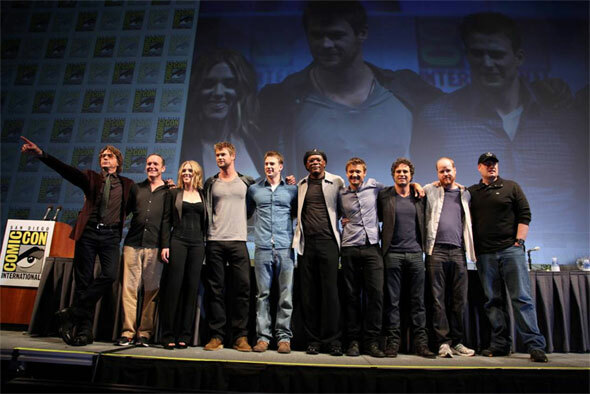 Whedon and the cast were given a standing ovation. Marvel Studios really wanted to bring something special for Comic-Con, and they brought something very memorable. Days ago I said that the panel for Captain America: The First Avenger was one of the landmarks for Comic-Con this year, but the surprise role call for the Avengers is the landmark for Comic-Con.